I’ve come across yet another suburb name that a part of Braamfontein was once known as: Argyle (or Argyll). This was once known as Johannesburg’s smallest suburb and was a few blocks west of the old Johannesburg Hospital. According to Anna Smith’s ‘History of Johannesburg street names’, the Transvaal Volksraad granted Commandant Daniel Egnatius Schutte land on Raandjeslaagte in 1893. 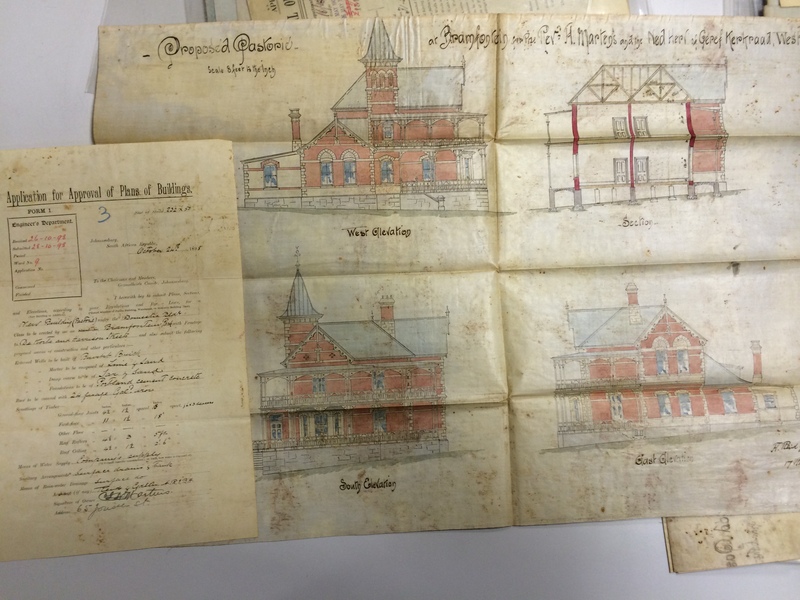 He acquired more land in the vicinity of the general hospital, De Korte and Simmonds Streets between 1894 & 1898. 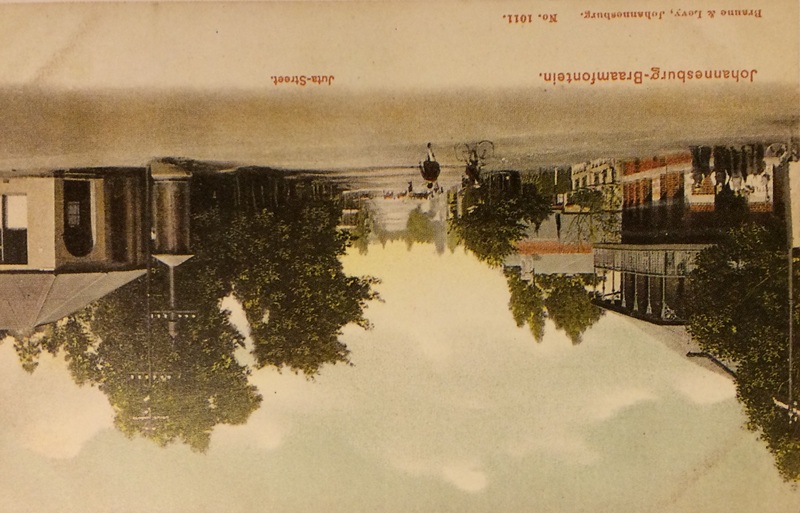 As such, the area was also known as Schutte’s or Schutte’s Ground. 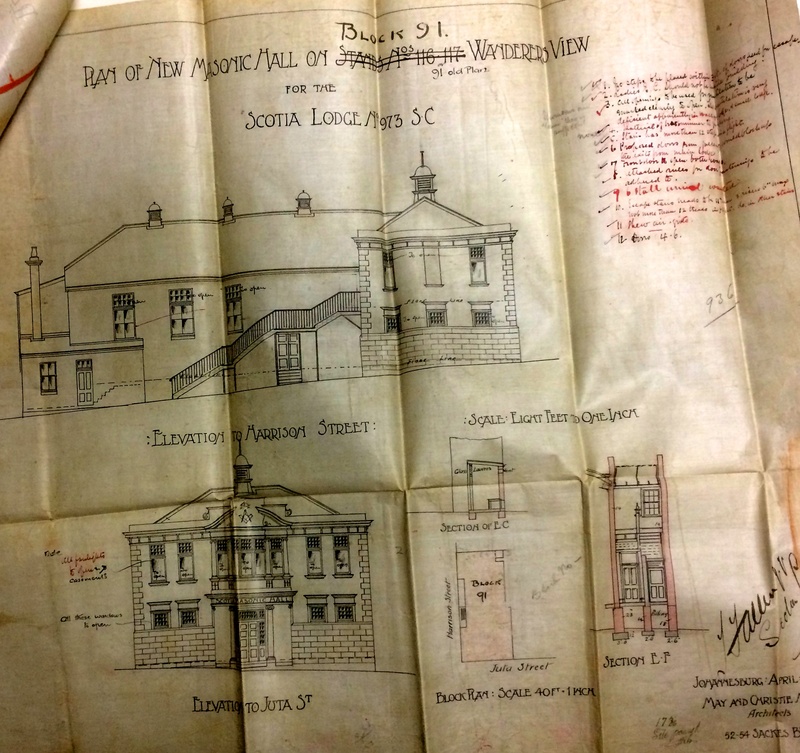 In June 1903 Messrs. Arthur Barnett & Co took over the lease and laid out the small suburb and 31 stands were sold on 26 May 1903. The name Argyll commemorates the fact that the Argyllshire Highlanders camped on Schutte’s ground for several months in 1902. 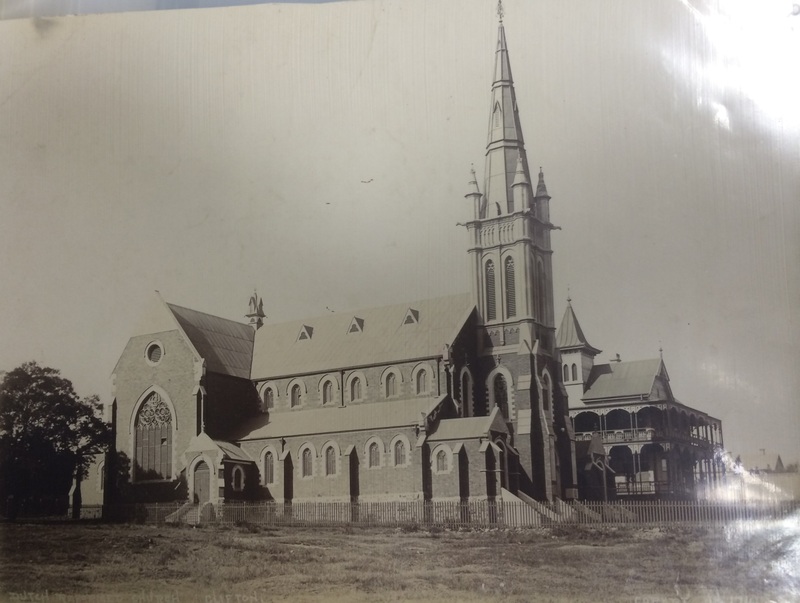 In the first part of this History of Braamfontein series I mentioned, under the section on ‘Clifton’, that land was donated to the government and churches and a post office were built on it. 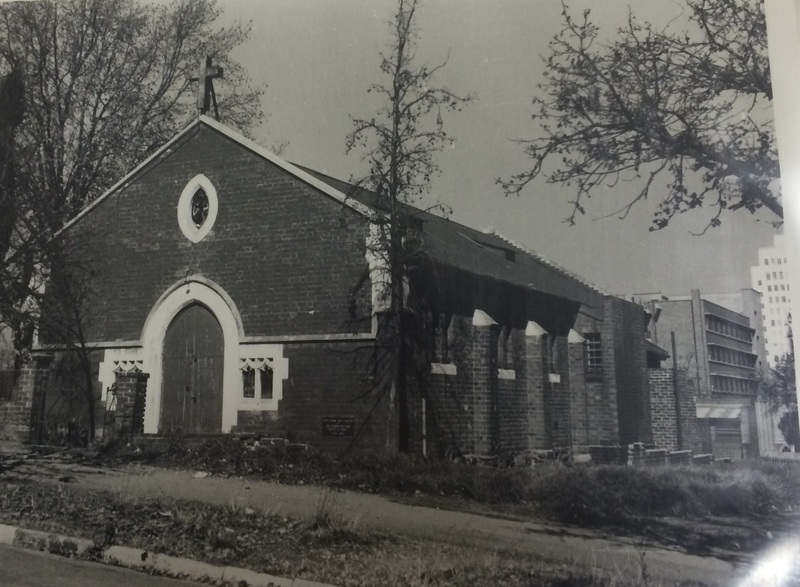 I posted pictures of the Clifton Methodist Church which was demolished in 1973. 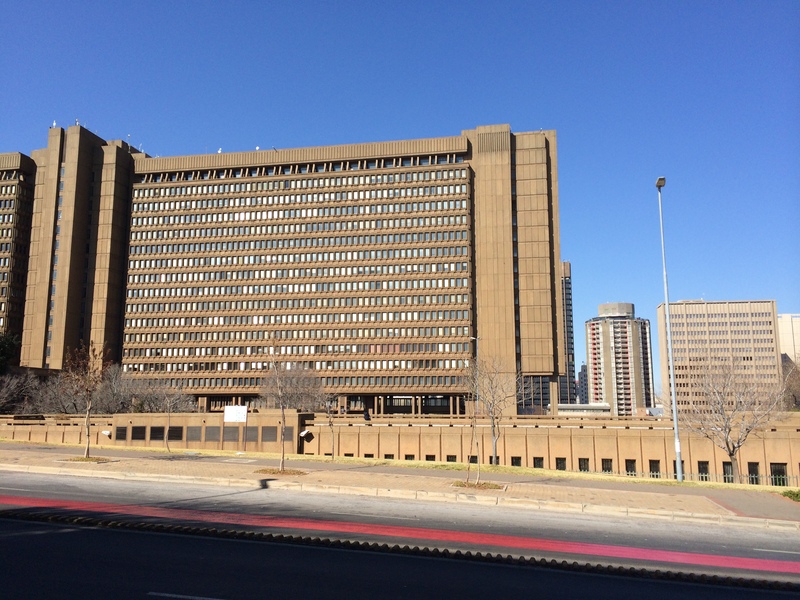 Here is information and pictures on the Dutch Reform Church and the post office as well as other ‘Lost’ Braamfontein buildings and houses. 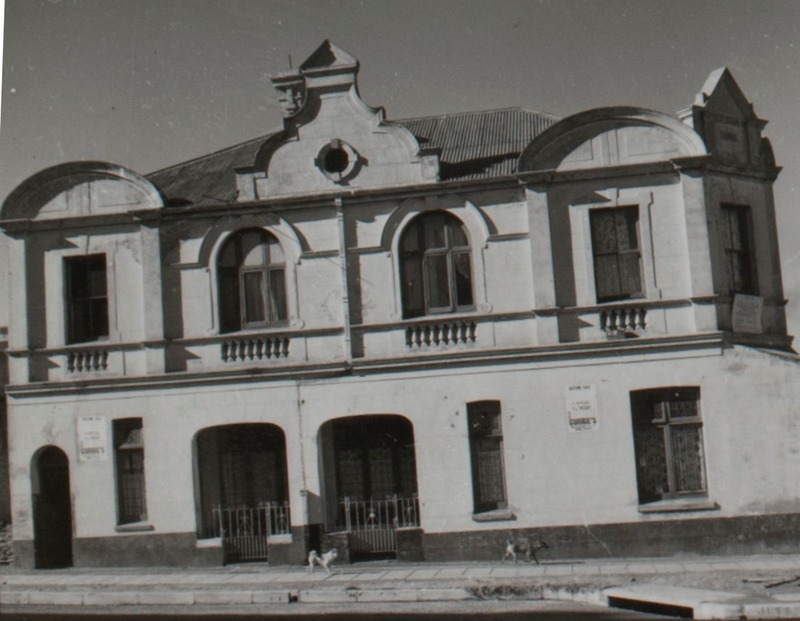 This is one of three similar post offices designed by Sytze Weirda’s Public Works Department (the other two were in Jeppe and Fordsburg with Jeppe being the only one still standing). Weirda was Chief of Public Works for ZAR and designed the Rissik Street post office, Plein Street Telephone Tower as well as other government buildings in Johannesburg and Pretoria. 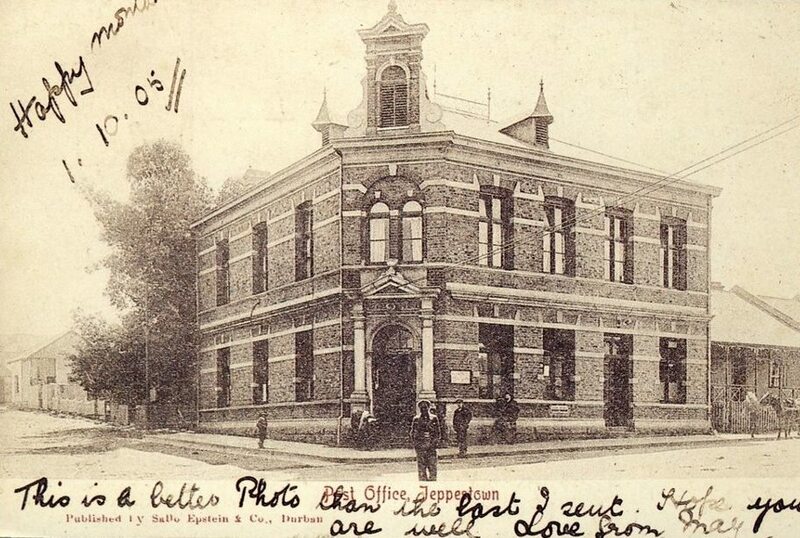 The Braamfontein post office (which was identical to the one still standing in Jeppe) was built in 1898 and opened in September of that year on the corner of Biccard and De Korte Street. 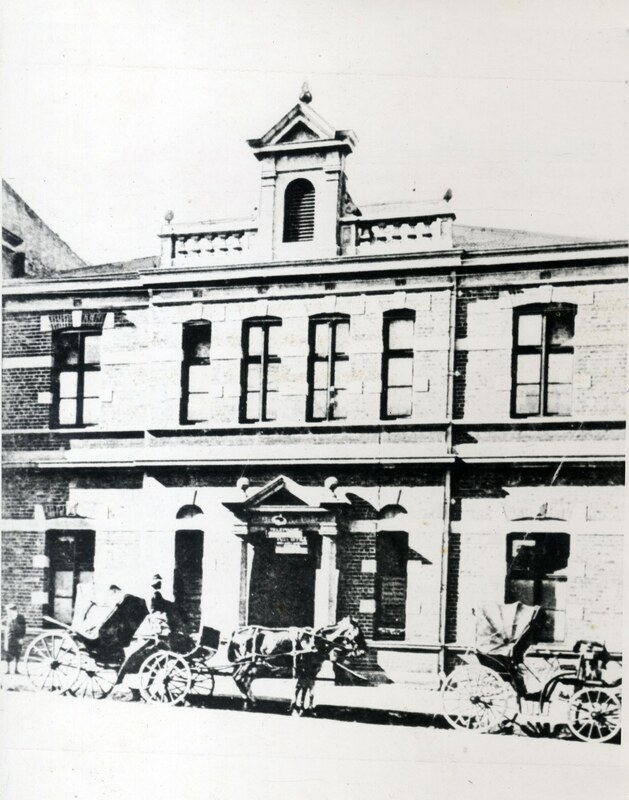 According to Anna Smith’s ‘Johannesburg Firsts’, it was the first suburban post office to be built. It was demolished in 1966 to make way for a bigger and more modern post office building. 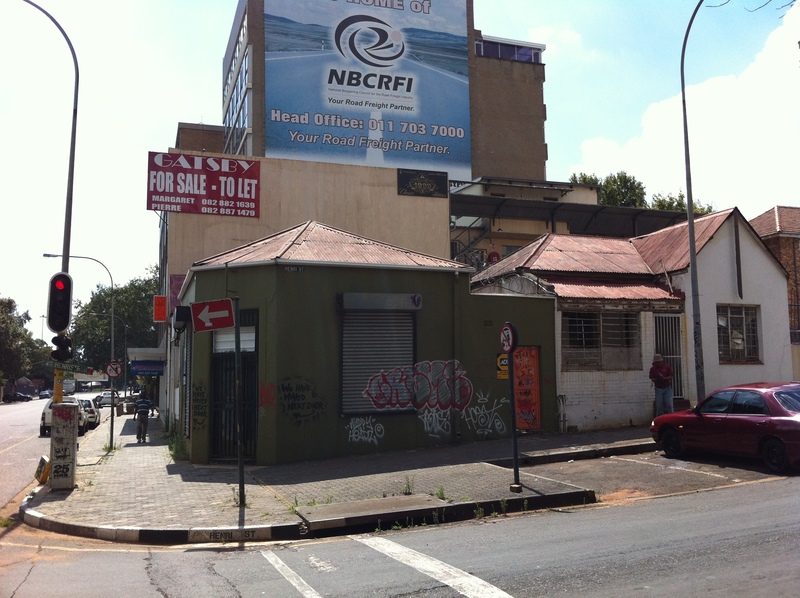 It was in Clive Chipkin’s book ‘Johannesburg Style’ where I first read about Weirda’s three post offices. Fordsburg was not mentioned but I can confirm that plans exist for a post office in Main Road Fordsburg on stand #90. 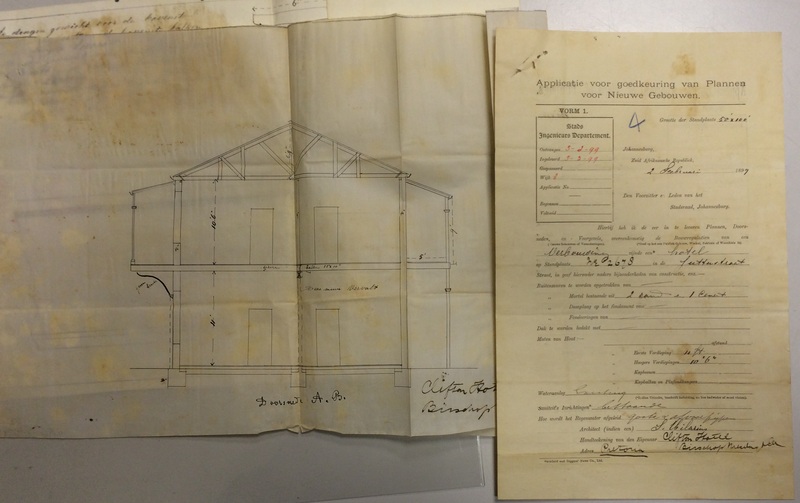 There is no original building date but there are listings for alterations and additions from 1908. The architect is listed as ‘C.J. Gyde – Public Works Department’ of which Weirda was the head. From the only picture I’ve found, one can see the style is in-line with the other two although for some reason, Fordsburg is not identical to the other two. 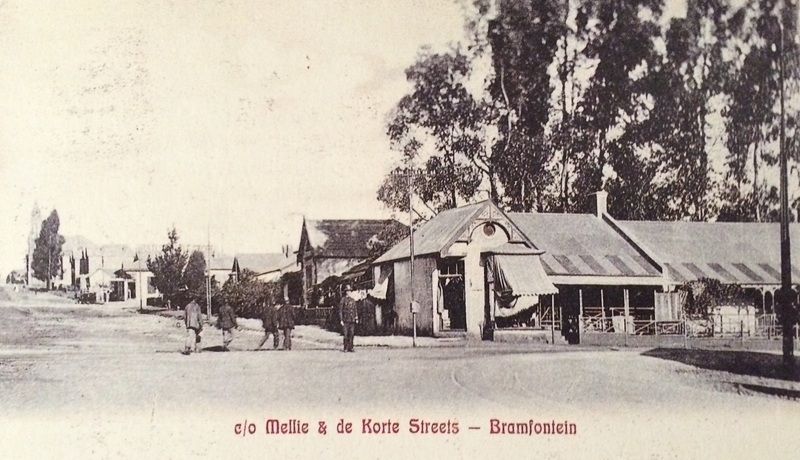 Just a few blocks down from the Methodist Church stood the Pirate Bottle Store on the corner of De Korte & Biccard Street. 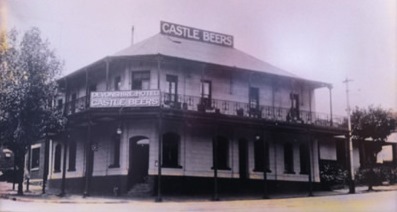 It was owned by liquor merchants Jooste & Bryant whose original building still stands in Jeppe (and is the only building left on Johannesburg with the iron lettering still on the roof). It was built in 1894 and designed by Charles R. Snell. 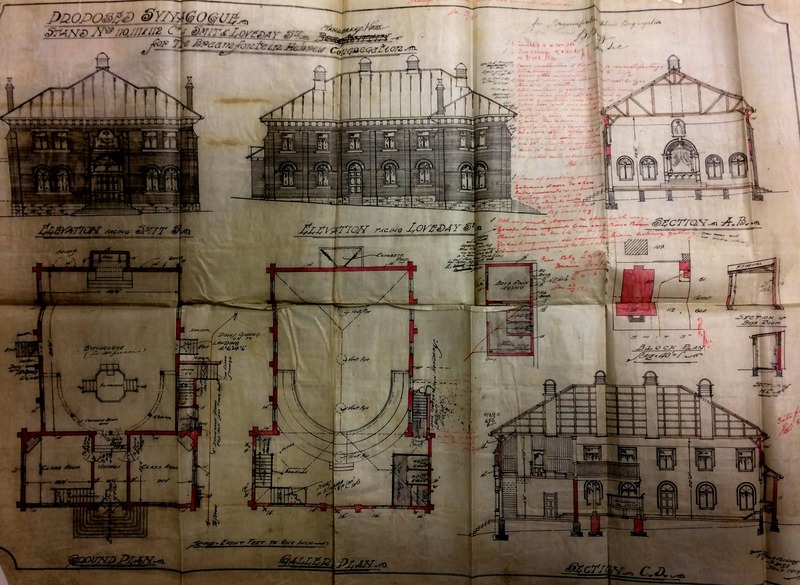 In 1897 and additional warehouse/shed was added by Snell & Waterson. The store with its iron lettering on the roof can be seen vaguely in the picture below. This was across the road from Kitcheners. It was a cottage/shop designed by H.A. Goodman for Mr. Freeman and dates back to 1894. It was common for shop owners to live on the premises. 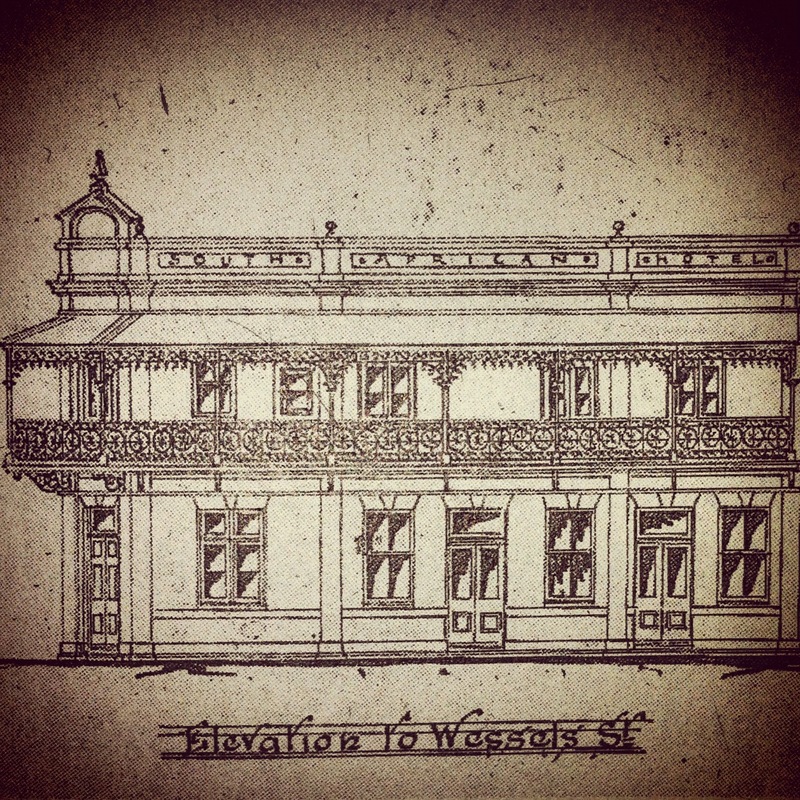 This hotel was diagonally across the road from Kitcheners and built in 1899 for owners Bisschop, Mesdas & Co. 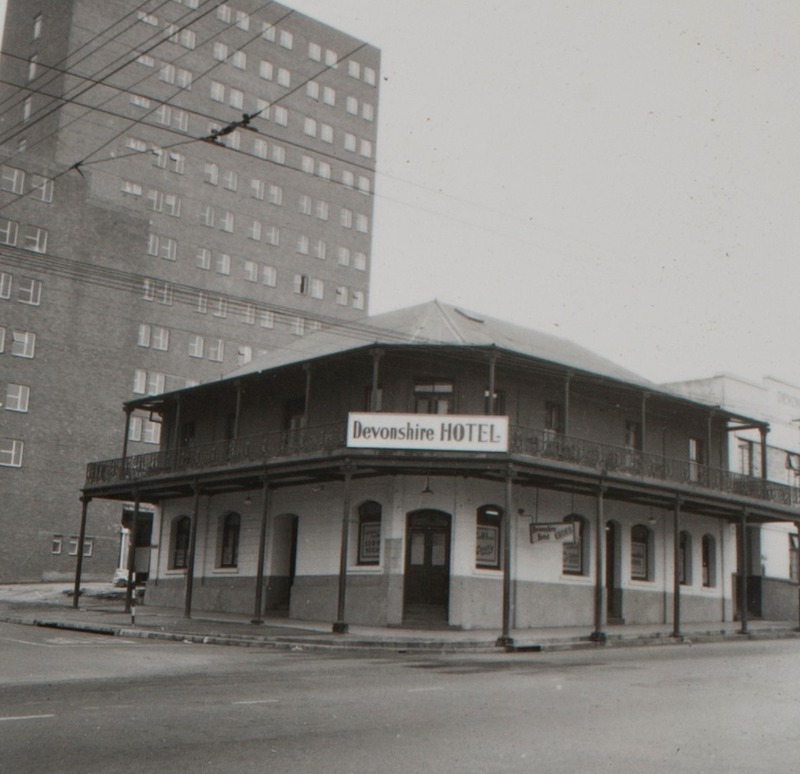 There were many similarly designed hotels in the area of which Kitcheners and the Devonshire Hotel (further down) are good examples. 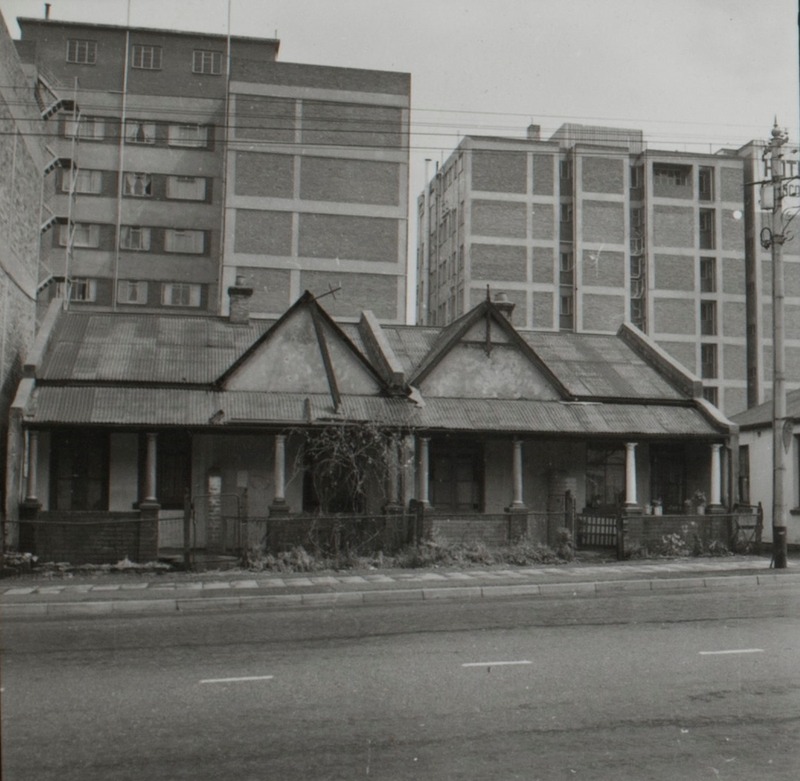 This is an another example of a typical hotel which was on the corner of Wessels and Juta street across from the Braamfontein Cemetery. 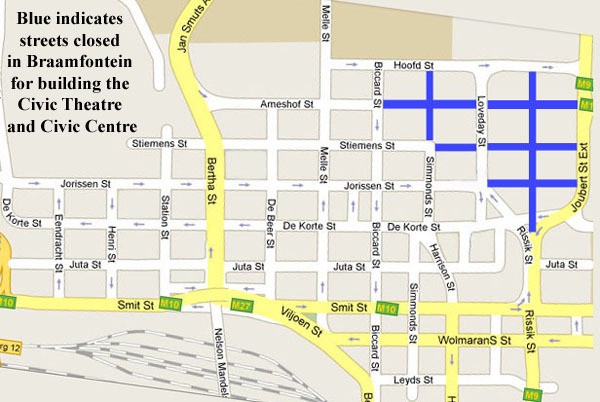 Braamfontein lost Graaf & Wessels Streets to the M1 highway in the late 1960s. Official sites date this hotel to the 1930s but one can see from the early pictures that it was more likely to have been built around late 1890s – early 1900s as it is in the same style and structure of other hotels in the area with verified dates. The original building no longer exists. The residence for S. Sacke on the corner of Wolmarans and Loveday Street designed by Harry Clayton in 1892. In 1939, on the same stand, a block of residential flats was built for owners Leeds Buildings LTD. Today, it’s an open piece of land with the flats having been demolished at some point. 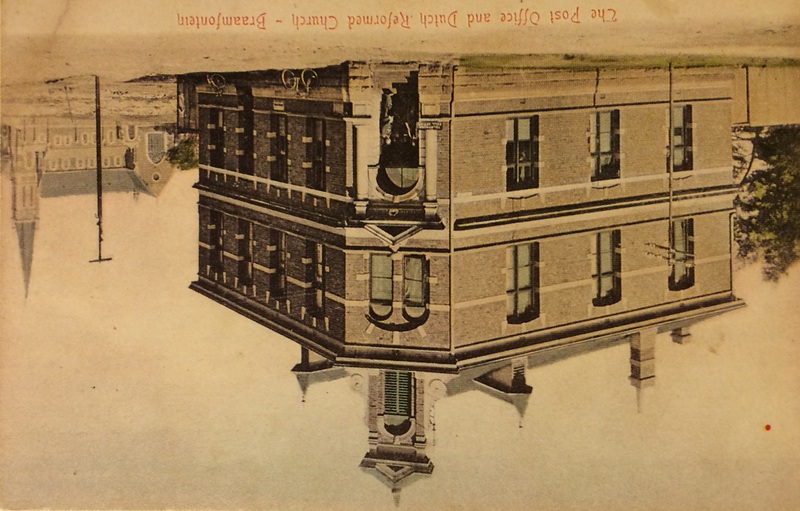 On the corner of Wolmarans and Harrison Street is 1896 Geldenhuys Building which is now known as Akhalwayas 2005 Building. The bottom floor used to be occupied by Corbett Bros. Family Grocers. The top floor was presumably flats. The pictures below show a then and now comparison. Note how the ornate 1st floor veranda is no longer there. The Sacke residence mentioned above would have been to the left. On one of three corners of Juta and Harrison Street stood a Masonic Temple (one corner was the Clifton Methodist Church. 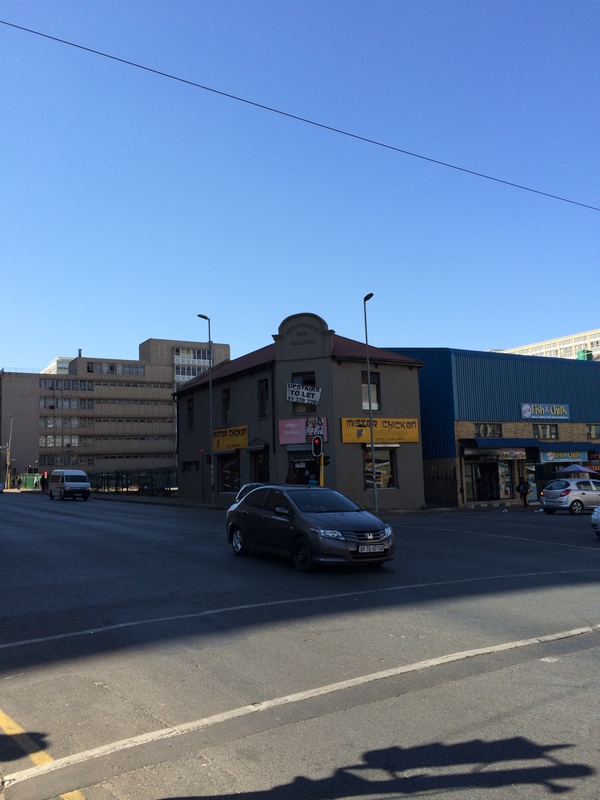 Two of the corners are now just street level car parks and the other across the road from Damelin is a Parkade). It was built in 1906 for the Trustees of Scotia Lodge No.973 and designed by May & Christie. There are two lodges I found attributed to Braamfontein: Scotia Masonic Hall is listed as being in Braamfontein and was one of the meeting places of Richmond Lodge (1904). Clifton Lodge met at Clifton (?) in Braamfontein amongst others like the Masonic Temple in Plein Street and the Freemason’s Hall in Parktown. Perhaps Clifton & Scotia Masonic Hall was the same temple used by both lodges. 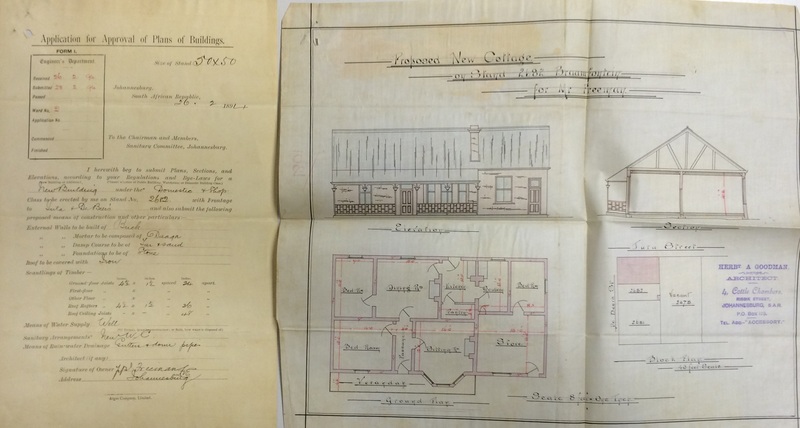 I’ve yet to find any pictures for this building but the plans below will give some indication. Below are plans to a proposed Synagogue for the Braamfontein Hebrew Congregation on the corner of Smit and Loveday Streets. I’ve not come across any other information on this building but will update when I do. According to the plans it was designed by S. Isaacs and dated 1919. In 1950 it was established that a Civic Centre was needed. 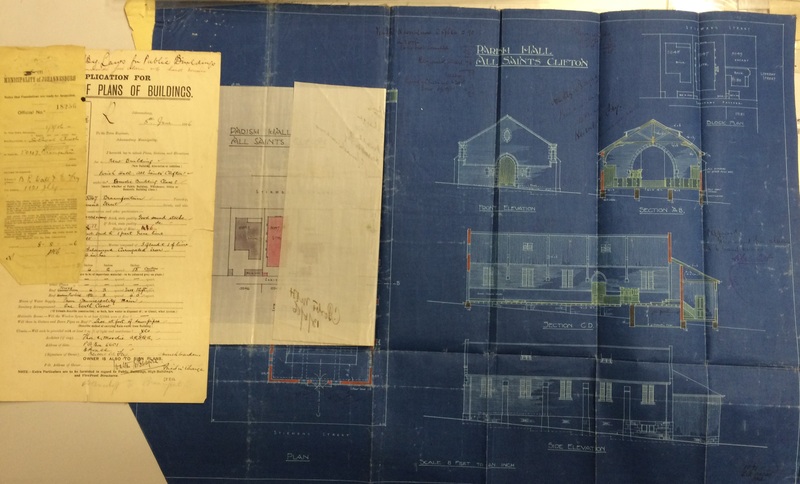 Further planning was deferred until 1953 due to lack of funds. 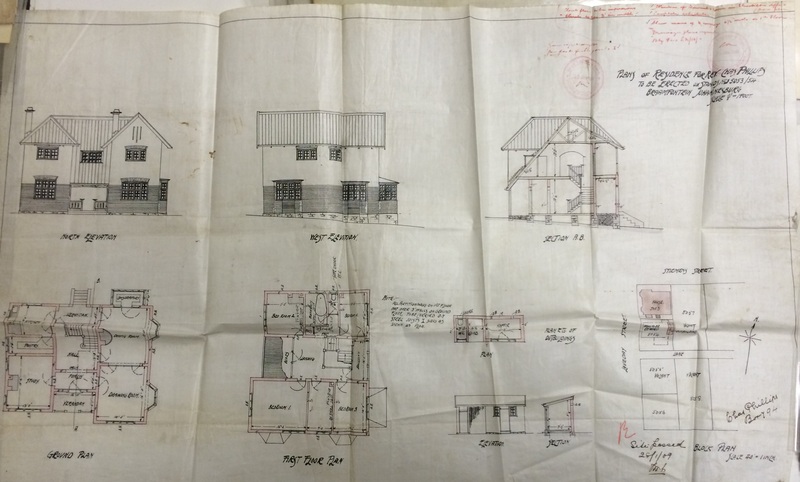 In 1954 the council started negotiating with the home and property owners in the land earmarked for development. This was completed by June 1960. Demolitions, road closures and site clearance followed. A design competition was held and the winning design was picked in 1962. 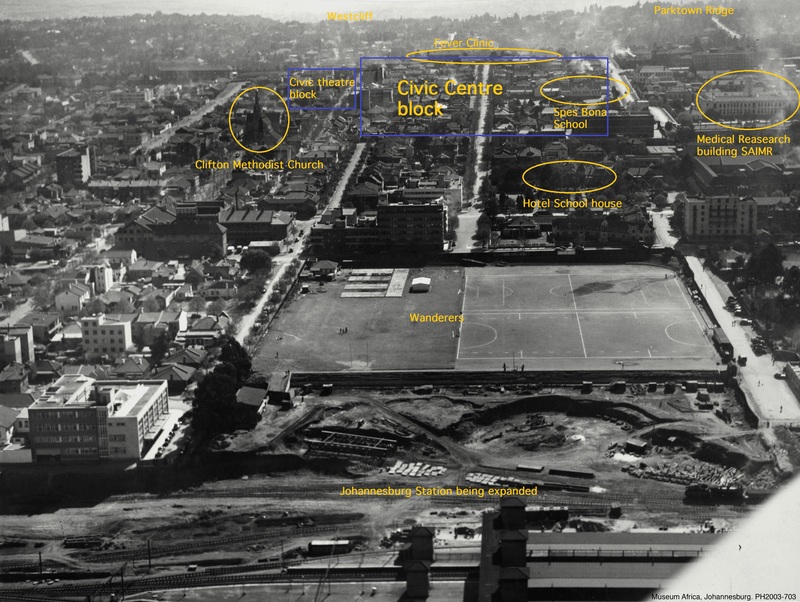 By 1967, excavations for the underground parking and basement levels were on track. 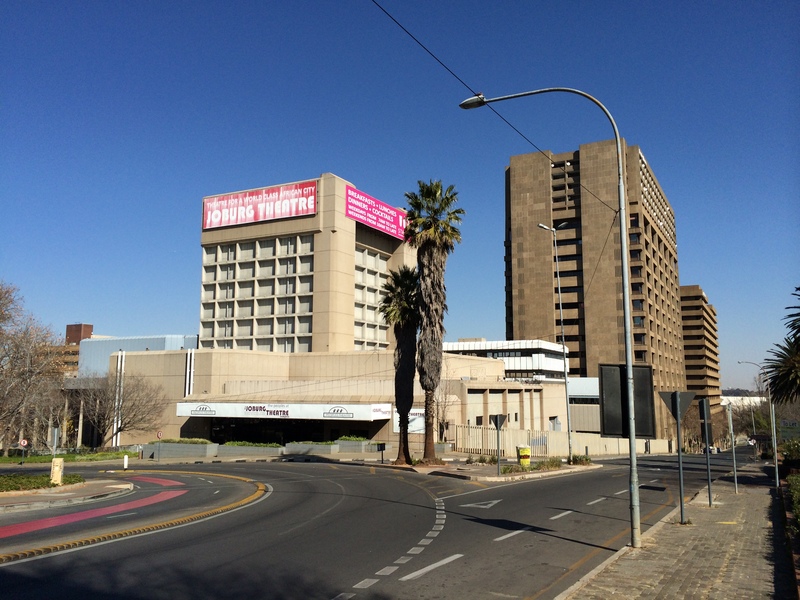 Contracts for the two blocks were awarded (around some further financial constraints) and the Civic Centre was completed in 1971. 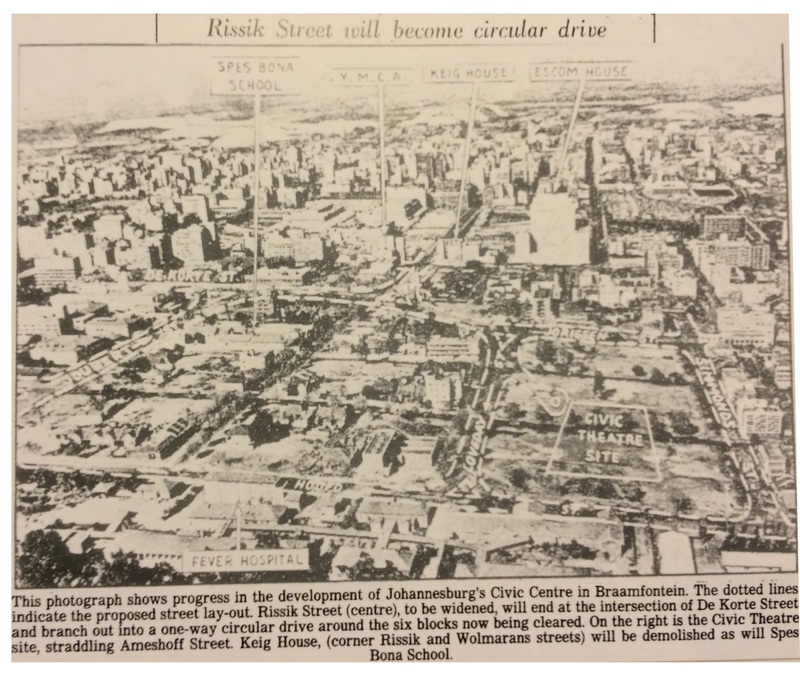 The one-way system around the Centre (which still exists today) came under some criticism. It was explained that the purpose was to ensure that officials arriving to work late didn’t collide with those leaving early… a light-hearted observation I’d imagine. Braamfontein looking north toward Parktown from mid 1950s. Roughly mirrors the map further up. This school was built in 1905 and designed by the Public Works Department. It was originally known as Hospital Hill School. Around 1909 it became the Spes Bona School and presumably stayed a school until it was demolished to make way for the Civic Centre. It was bounded by Steimen’s, Jorrisen, Rissik and Joubert Streets. This was a church built in 1906 and designed by Thomas Anderson Moodie. 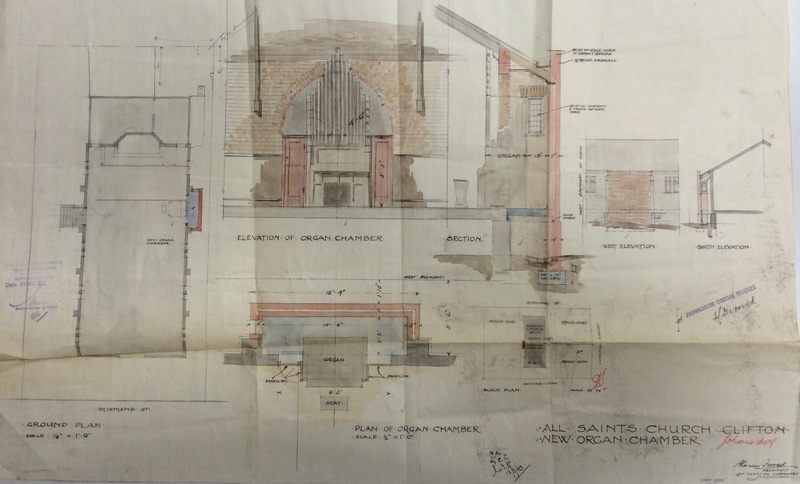 In 1933 an organ was added as per the plans below. Note on the plans how ‘Clifton’ has been crossed out and replaced by Johannesburg. Alexander Forest was the architect of the organ chamber addition. This church was built in 1897 in Loveday Street. It was designed by Howden and Chandler. 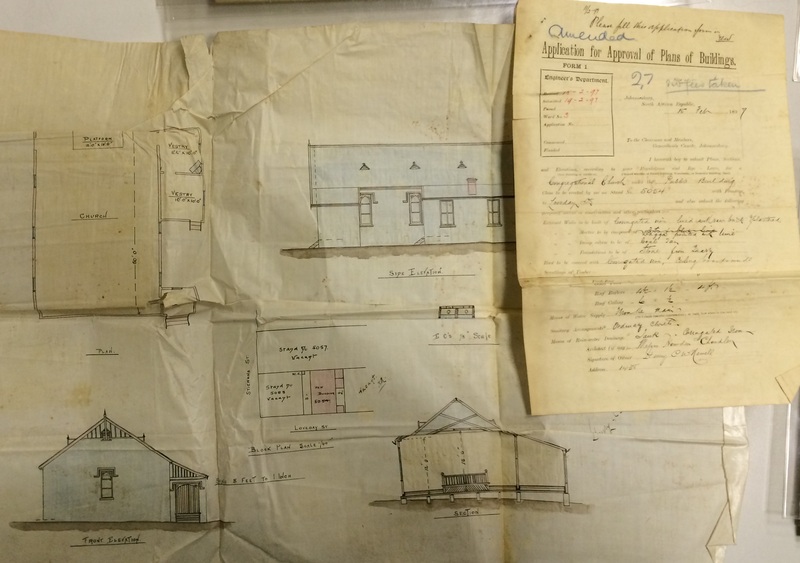 The plot of land on the corner of Loveday and Steimens was developed in 1909 for one of the Reverends but there appear to also be plans for a proposed church on that site. 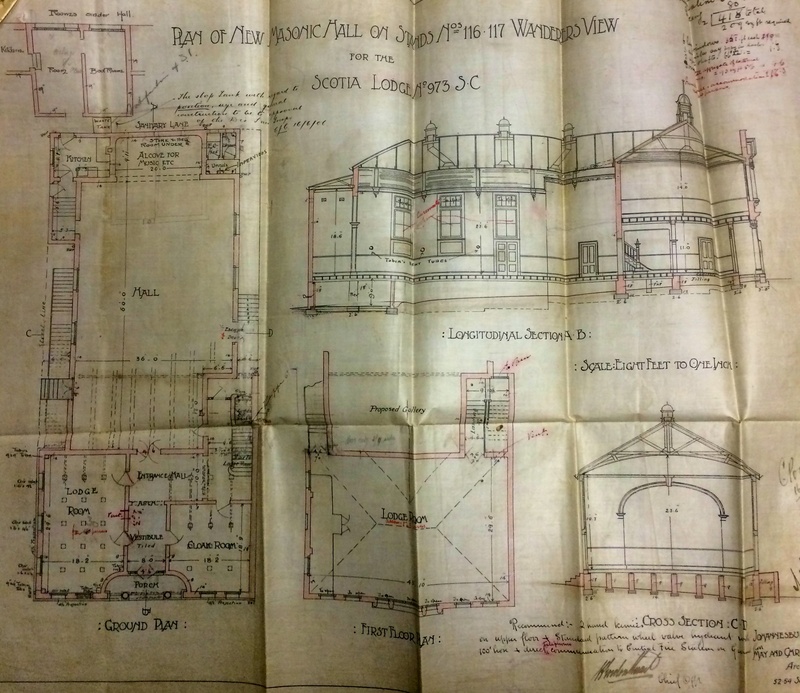 I’m not sure if it was ever built, as the 1909 plans show the stand with the house and the church next door and the 1897 plans show the stand as vacant. 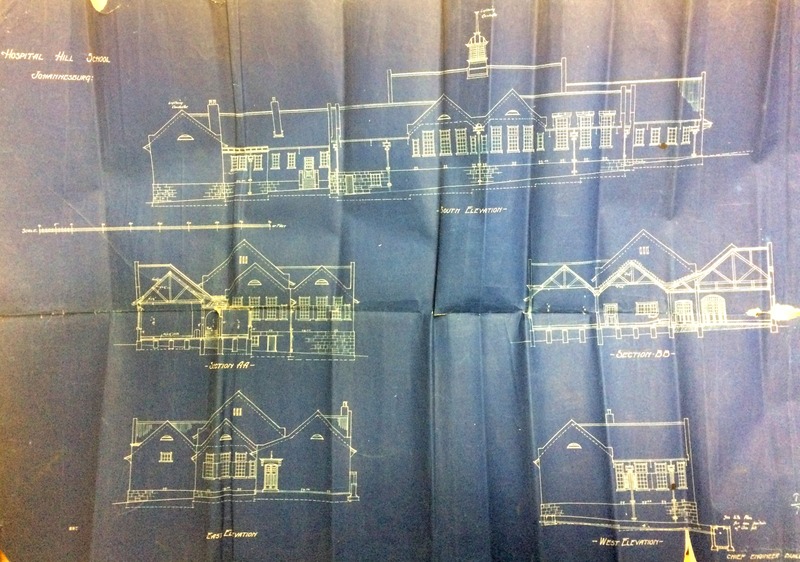 I found reference and plans for a residence for Rev. Phillips from 1909. 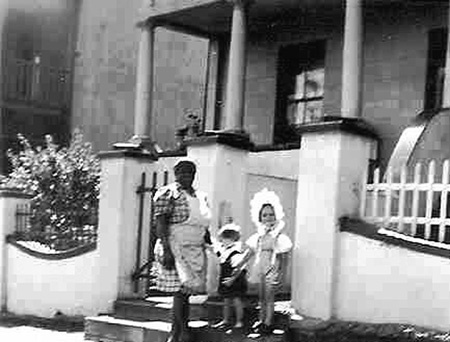 This house was built on the corner stand of Loveday & Steimens Streets as mentioned above. The area where the church and house stood is now an open grassed area in front of the Civic Theatre. 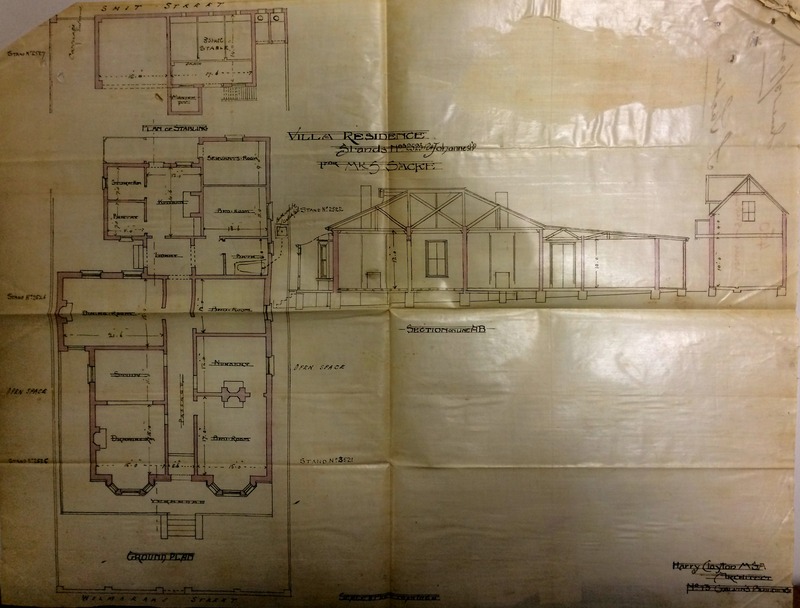 These pictures were sent to me by Japie Bosch (as well as the Civic street plan) and show various houses in Ameshoff Streets in the vicinity of the future Civic Centre from 1948 – 1952. Below are various examples of buildings, flats and houses that have been demolished over the years. Unfortunately I don’t have the exact locations for many of these. 30 Sep	This entry was published on September 30, 2014 at 2:25 pm. It’s filed under Johannesburg and tagged All Saints Clifton Parish Hall, Ameshoff Street, Argyle, Braamfontein, Braamfontein Dutch Refrom Church, Civic Centre, Civic Theatre, Clifton, Clifton Methodist Church, Devonshire Hotel, Early Johannesburg, Geldenhuys Building, Henri Street, history of johannesburg, Hospital Hill School, Jooste & Bryant, Juta Street, Sacke Residence, Spes Bona School. Bookmark the permalink. Follow any comments here with the RSS feed for this post. Thank you for this fascinating article. I can remember seeing the semis in Braamfontein in the 1960s from the days when I went to plays at the Alexander Theatre. Thanks Jean! I remember a few of the old houses from the early 80s when my mother worked in Braamfontein, but even then, there were very few left. As a resident of ‘Braamies’, I have found this series on Braamfontein, fascinating Thank you for sharing all your research. Suburb was named after the Argyll and Sutherland Regiment which camped there. My great-great grandfather was a member of the regiment The Argyllshire regiment became the Argyll and Sutherland in 1881. That is why the only street is called Sutherland. I lived there for three years in the mid 80’s. Hi Marc, My grandmother lived in Braamfontein with her four sons. My Uncle was born at 2 Station Street, Braamfontein. Recently I came across a death notice which stated that the man died 20 May 1955 at the Voortrekker Perseel, Jorrissen Street, Braamfontein. I have looked at all the old maps I can find and have not found where that might be. Do you have any idea? In 1940 about the General Dealers business of Zlotnicks corner De Korte and De Beer streets was destroyed by anti government forces and on the same day or shortly after also Hurwitz’s premises corner de Korte and Eendracht. The lone post box in front of the Post Office was also targeted. Never heard of Voortrekker perseel. There is mention of church in lower Stiemens Street, or Ameshoff which did not exist in my time. But I do remember the old Anchor Yeast Factory in Stiemens Street between Melle and Biccard Streets. Passing the fcatory some good soul always gave us chunks of yeast to eat. Melle street where it goes over the ridge at Hoofd Street was only tarred late 40’s. 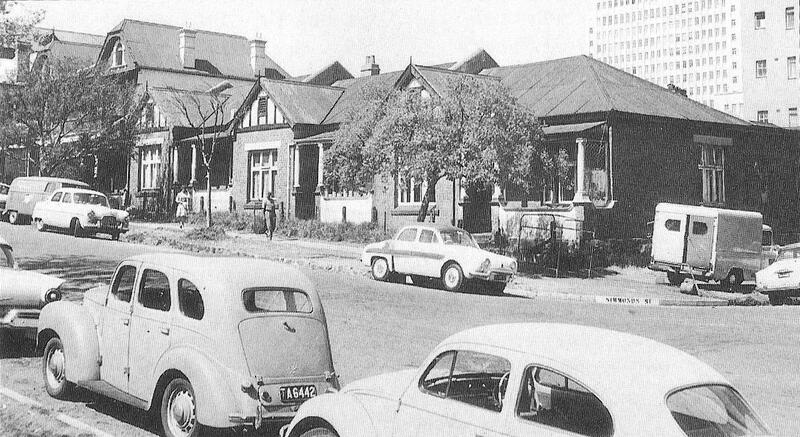 The Royal family drove up Melle Street toward Parktown and over that formidable ridge in 1947. 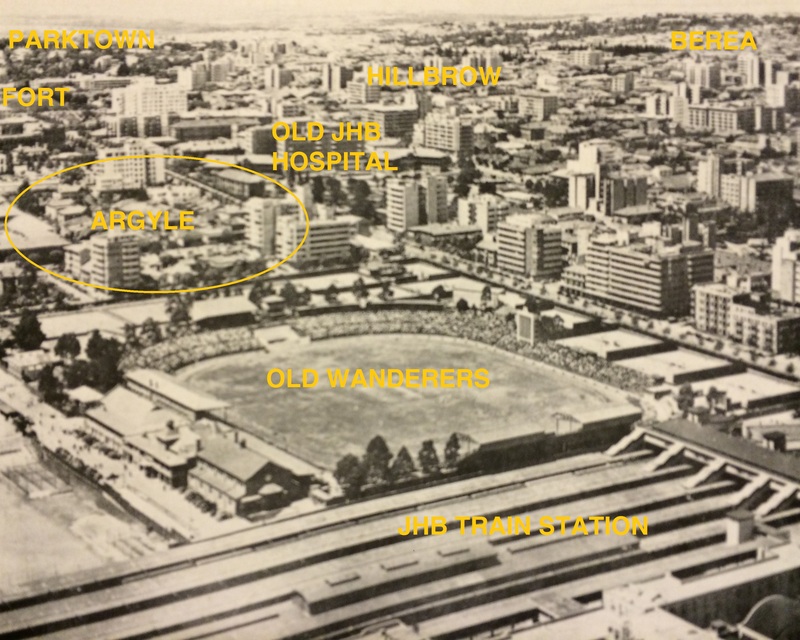 All the soil excavated from the Old Wanderers Ground for the new station was used to build terraces at the Normal College on the north side facing Parktown. Empire Road used to be a river and there was a weir in the grounds of the old Helpmekaar girls school ground (before the school was built). As children we often played on the weir which we referred as Goliaths Grave. During the second world war I saw trenches built on the north side of Wits grounds and at the Women’s gaol. Think I solved your problem…. Voortrekker-Pers Beperk was the publisher of Die Transvaler morning newspaper. 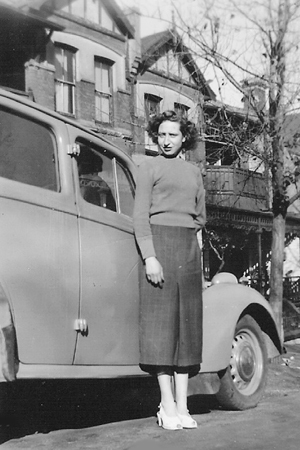 The building was in Jorissen Street between Biccard and Simmonds on the south side. It was a four storey building constructed in about 1946/7, certainly before 1948 because I remember the merriment in front of the building when 1948 election results were announced. I lived in Braamfontein from 1934 to 1958. Firstly in 156 Loveday Street corner of Jorissen Street. 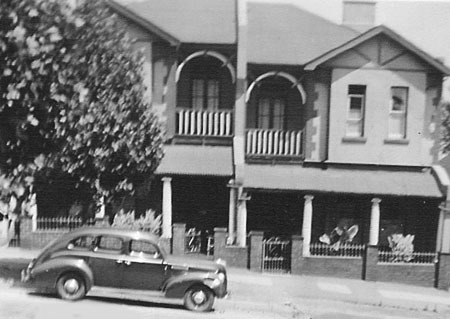 In 1938 we moved to 55 Stiemens (please correct your spelling) street where I stayed till December 1958. My brother and sisters went to Spes Bona primary and always spoke well about Miss Eitzman their teacher. I went to Braamfontein Afrikaans Medium Skool was tucked behind the Braamfontein post office on the corner of De Korte and I think Simmonds streets. 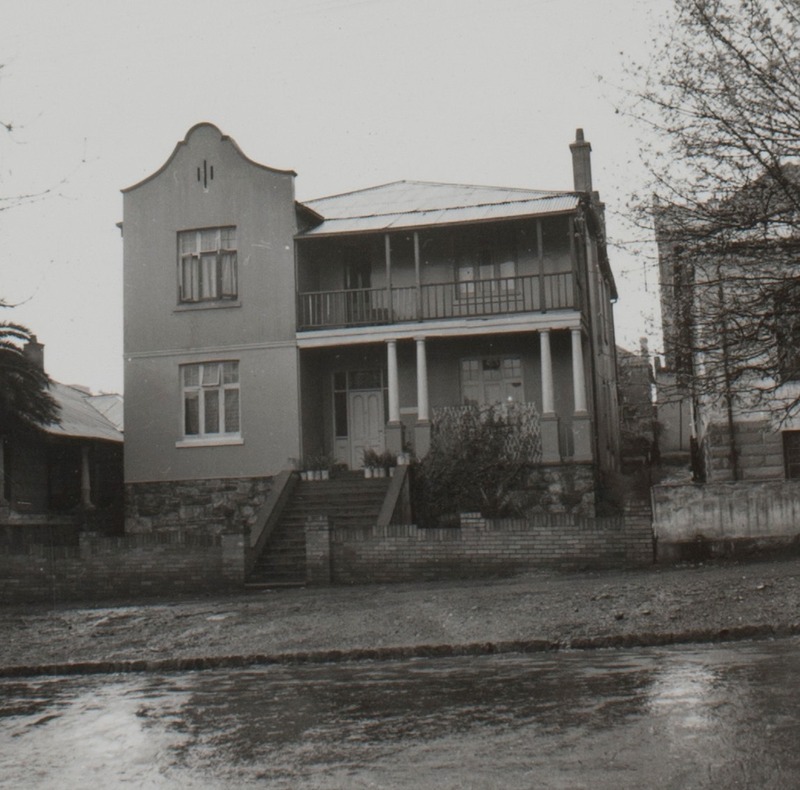 I recognise 58 Ameshoff Street which belonged to Archie de Beer and his wife Lavinia. 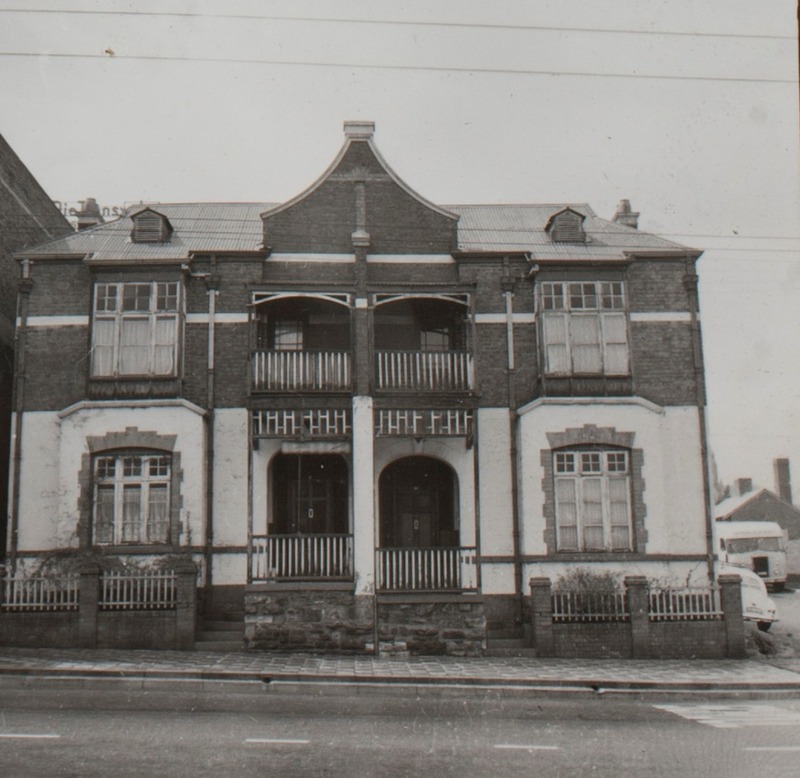 The Double Story Semi looks like one owned by Mrs le Roux who used it as a boarding house and it was situated in Stiemens Street. The double story semi house was probably that of Rev Philps. I kinoe The Oppel family lived there in my time. The last stables I knew about were in Stiemens Street just oiff de Beer street on a site later used as the Alexander Theatre. 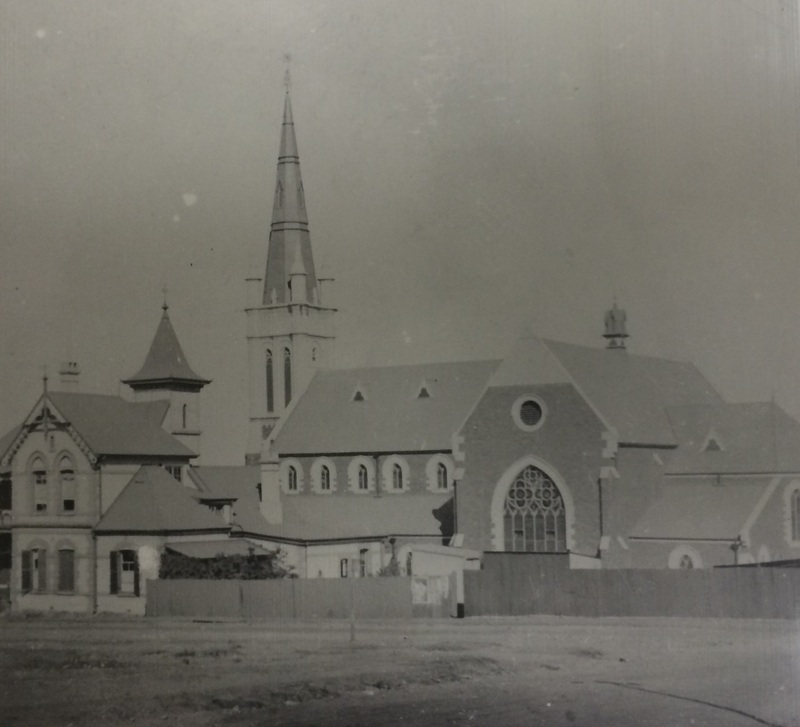 Anothe stable was in Simmonds Street just off Jorissen Street and was attached to a Boarding house in Jorissen Street run by Mrs. Revelas. William & Hurwits had a stable across the road from the shop They use to delivery supply by horse & cart We use to hand onto the back of the cart and the driver use to get mad at us and try to hit us with the horse wip. Enjoyed this! Very worked in Braamfontein for many years. My great grandfather was buried in the New Cemetery according to his death certificate. Is the cemetery still in existence? Hi George. Yes, both Braamfontein and Brixton cemeteries are still in existence. 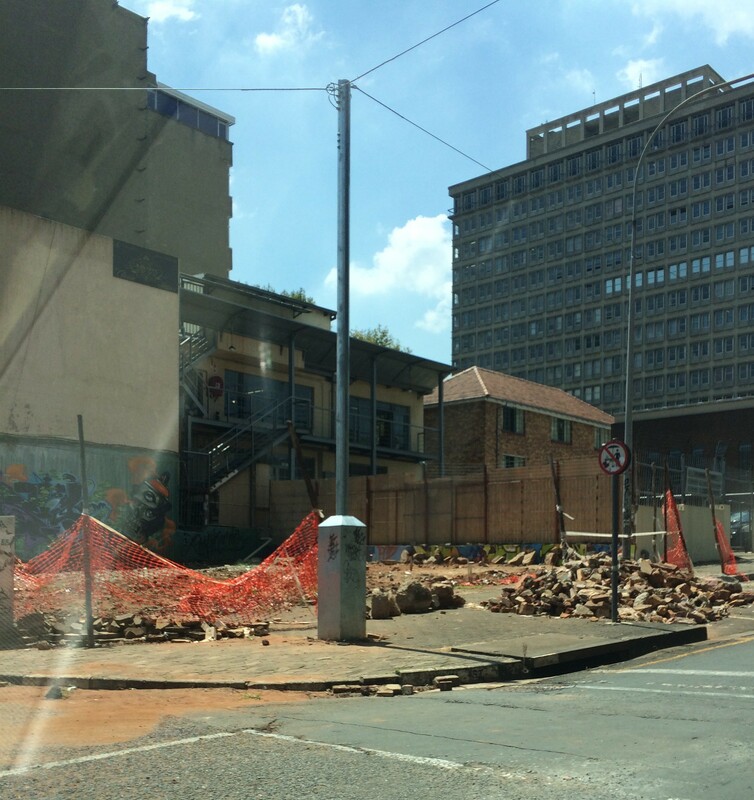 All burials from the very first and short-lived cemetery in Loveday Street were moved to Braamfontein. Hi Marc Thanks for your response. 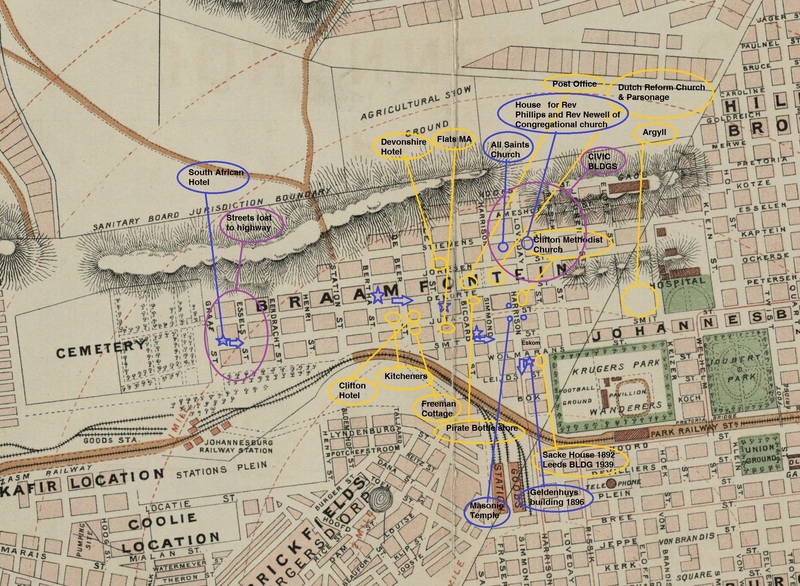 On the old map you included above shows a cemetery in Graaf street and there is a station across the road. It seems to me that neither Braamfontein nor Brixton cemeteries fit the bill. Do you know whether either of these were previously known as New Cemetery? Hi Marc Thanks to your excellent articles and maps I managed to solve the riddle. 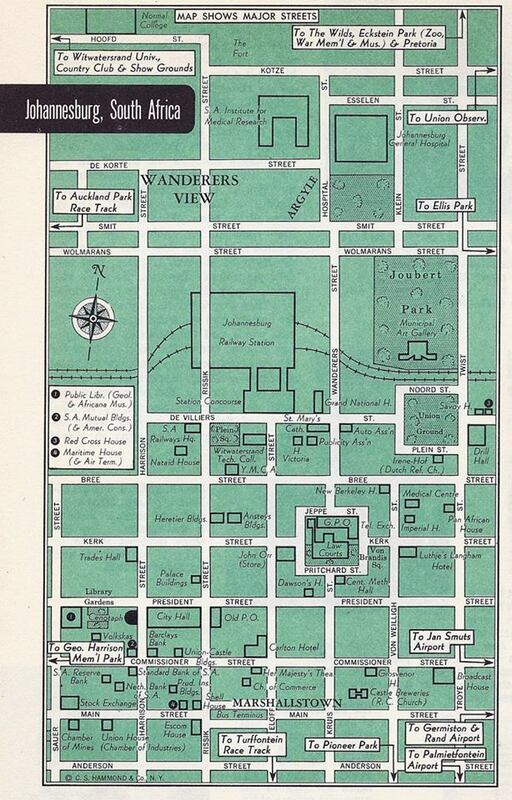 Your 1929 Map clearly shows New Cemetery to be the one in Krause Street and the Old Cemetery to be the one in Graf Street. In todays terms the cemetery in Krause street is the Brixton Cemetery and the one in Graf Street is the Braamfontein Cemetery. Hope I am right. Many thanks for your lovely articles. I came across it by Googling for the New Cemetery, but found it so fascinating that I am now reading all the articles in your archive. Hi George, that makes sense. 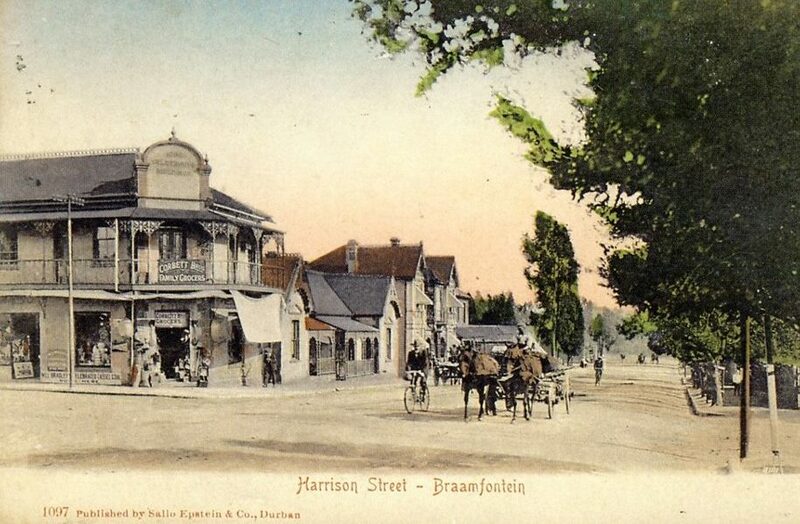 Braamfontein was the ‘new’ cemetery in the 1890s. Brixton was the next ‘new’ cemetery after that. Your streets are correct. Thanks for reading!